We have got a 25 bedded, 8000 sq ft casualty department capable of managing all medical emergencies. Around 15 doctors and 30 nurses are responsible for running the department round the clock. Efficient doctors are managing the trauma care centre attached to the casualty. Casualty is equipped with Ventilator and portable ventilator units. 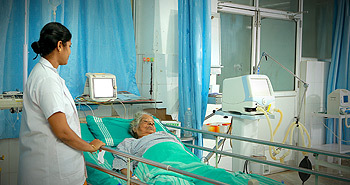 In addition, we have central oxygen and central suction facilities.